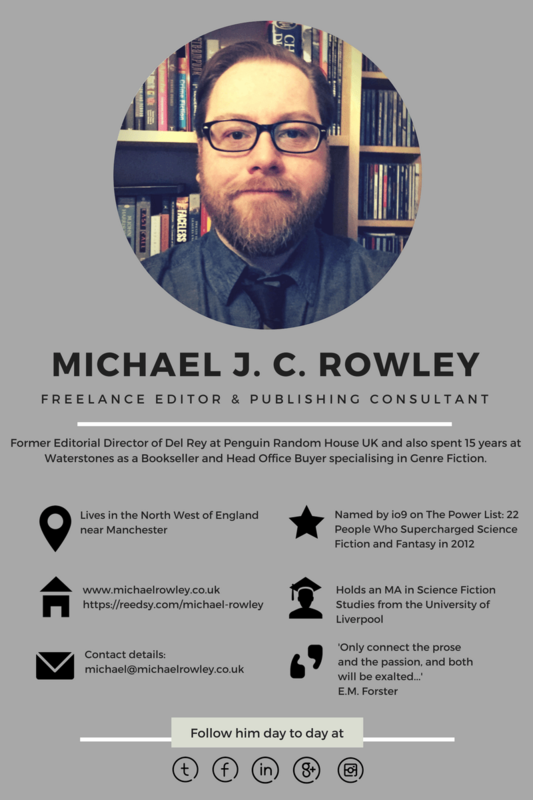 I am a professional Fiction Editor and Consultant based in the North West of England with a unique blend of experience in publishing and the retail book trade. While Editorial Director of Del Rey at Penguin Random House UK I commissioned and published many exciting writers including Andy Weir, author of the Sunday Times bestselling The Martian, the award-winning Kameron Hurley, Mark Hodder, E. J. Swift, epic fantasy writer Django Wexler and more. I now also work as Consultant Commissioning Editor at Rebellion Publishing across the Solaris and Abaddon Books Science Fiction, Fantasy and Horror imprints. Before running Del Rey, I worked for Waterstones booksellers for 15 years, first as a Bookseller, then as a Head Office Fiction Buyer. I held various positions from Fiction Core Range Buyer, where I managed the whole fiction backlist for the company, to Science Fiction, Manga and Graphic Novels Buyer and Genre Fiction Campaign Buyer. In particular, I specialised in genre fiction across SF & Fantasy, Crime Fiction, Thrillers, Romance, Westerns, Graphic Novels and Manga. In today’s competitive market, making sure your manuscript is as ‘submission-ready’ as possible will give you the greatest chance of placing your work with an agent or publisher. My aim is to work with you to make your book as ready as possible. I offer various services, from a full structural and developmental edit to a ‘first-look’ reader report assessment, as well as practical advice on how to proceed at the beginning of your project or help with your query letter and sample text for submission to agents and publishers. Contact me on michael@michaelrowley.co.uk to discuss your project and obtain a quote. I’m also available for one-on-one meetings in the North West or via Skype.